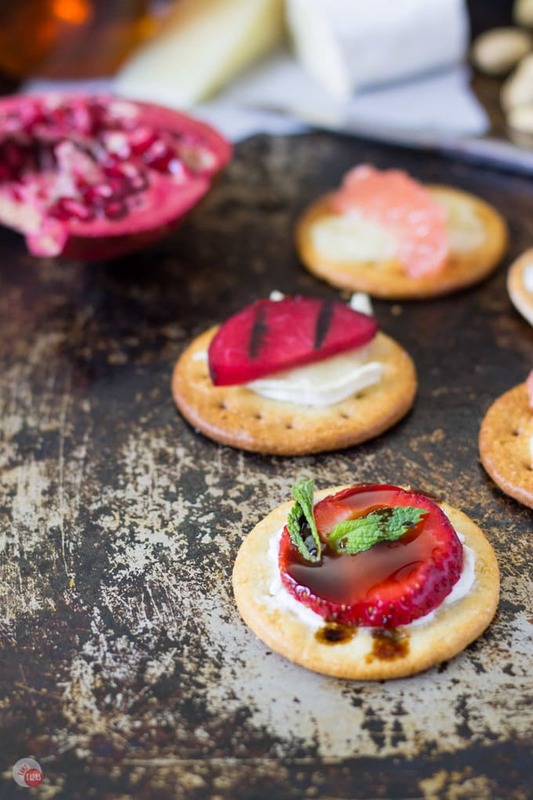 Serving cheese and crackers at your next summer party? Try grilled crackers for a unique twist. Melt your cheese and add other grilled toppings too! What could be more perfect that having friends over, or going a friend’s house, hanging by the pool, catching up while the sunlight lingers, and eating some good food from the grill? Not much in my book. Backyard BBQs are perfect for taking in the lazy days of summer (or evenings if you are still working full time) and just enjoying time with friends and family. Try grilled crackers this summer and wow everyone! A lot of people stress over throwing parties, but grilling in the backyard screams “stress-free” and fun. With all the summer fruits in season, you can even #DaretoEntertain in a unique way with your grill! I have been posting nacho recipes for the month of June and some might think that this deviates from those. Just because the crackers are not piled up with toppings poured on them doesn’t mean that they can’t be “individual” nachos! I had the idea that making nachos is fun, making personalized nachos is, even more fun, but making them on the grill while you are getting the coals hot for your other goodies is the best! We all have that time where you are standing around the grill waiting for the coals to get hot or if you have gas, getting the temp up so you can slap on your steak, your fish, or your veggie skewers. Boring! Don’t stare at the empty grate, put something on it that you can eat now! This is where Dare Crackers come in. 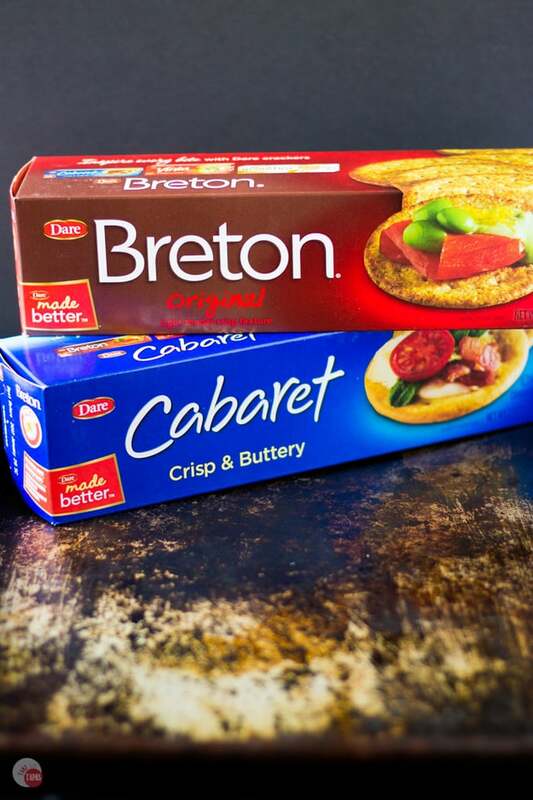 For these grilled crackers, I used Dare Cabaret for their buttery goodness and Dare Breton Original Crackers for their wonderful texture. Not only are they tasty and perfect to hold all these delicious toppings, but they are large enough in diameter that they don’t fall through the grates on the grill! I even threw some of my sliced plums and grapefruit slices on the grill too! Caramelizing the fruit adds a touch of sweetness to them that pairs perfectly with the cheese! You can make your own flavor combination according to what is in season or what you have on hand. For these grilled crackers, I chose a Manchego cheese, a soft goat cheese, and a rich and creamy Brie. Manchego is a Spanish semi-hard cheese that has a buttery nuttiness to it. It usually found together with pears and honey. This time, I went with tart pink grapefruit to mix it up. 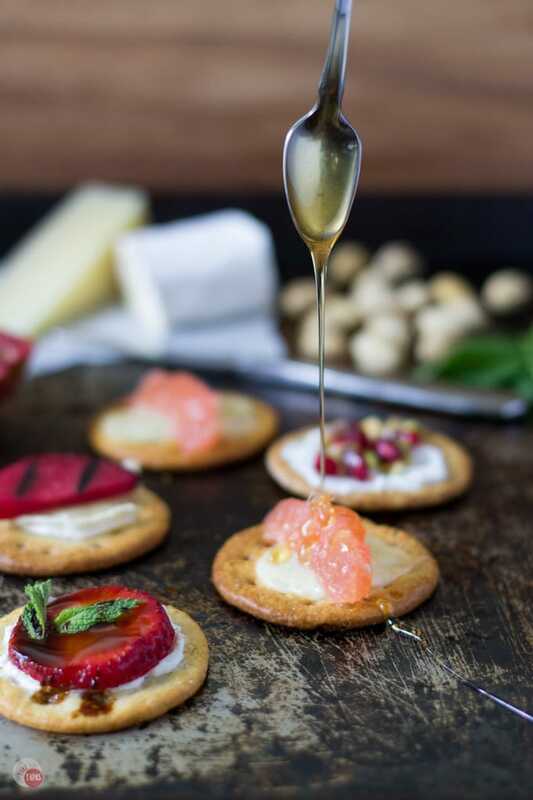 The honey is so sweet that the grapefruit brings it in harmony with the cheese and the flaky cracker. The richness and creaminess of the Brie plays well with grilled plums. The slightly tart yet sweet plum seems to melt into Brie as it melts on the cracker. I also did a classic pairing of fresh strawberries, mint, and some Balsamic glaze with the creamy goat cheese. The strawberry really shines with those flavors and brings freshness to the forefront. I threw in one more just for fun because they are two of my favorite things. Pistachios and pomegranate arils. 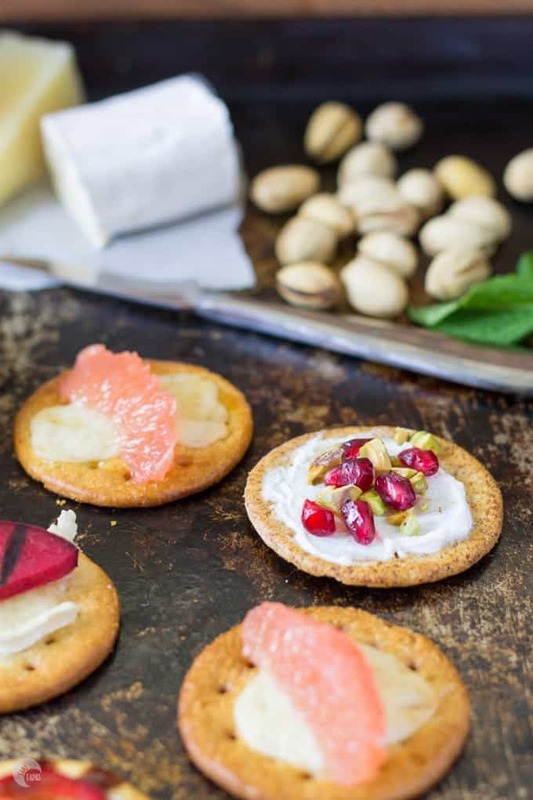 I had some pistachios already shelled and chopped so I cracked open a pomegranate and added them to the warm goat cheese already on the cracker. When you bite into it the arils burst with tart juice and you get a great crunch with the pistachios. 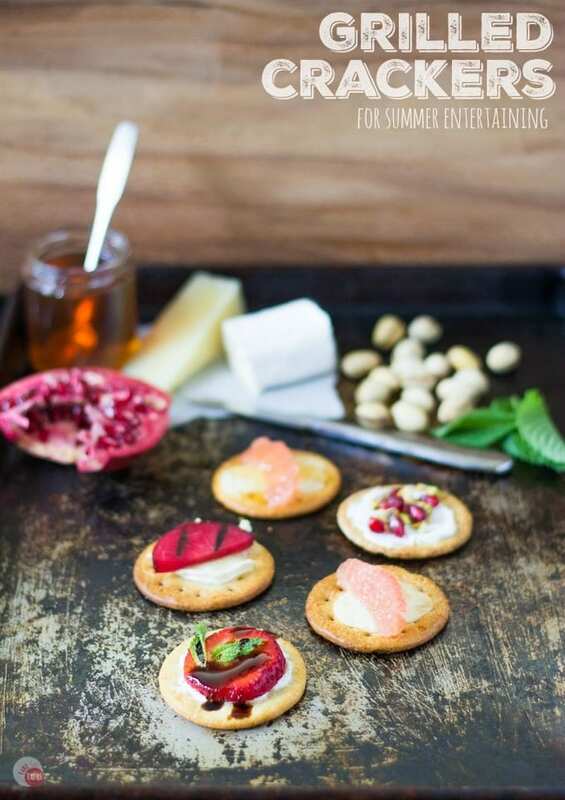 Serving cheese and crackers at your next summer party? Try grilling your crackers for a unique twist. Melt your cheese and add other grilled toppings too! Grilled Crackers for Summer Entertaining! 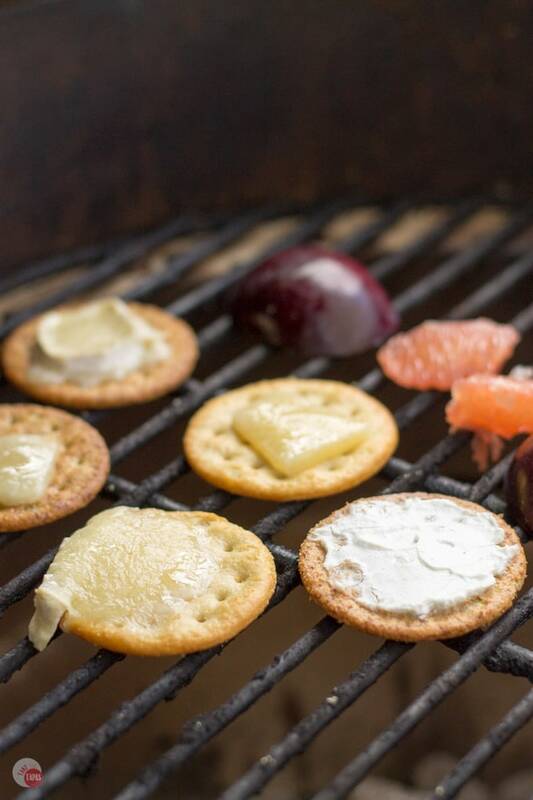 Place your crackers on your grill while the coals are heating up. Add your cheese of choice. Let the crackers sit on the grill grates until the cheese melts or is warm. Remove and top with favorite toppings! You can see my favorite combinations above. Don’t be afraid to grill the unusual and #DareToEntertain this summer outside! What will you grill this summer? 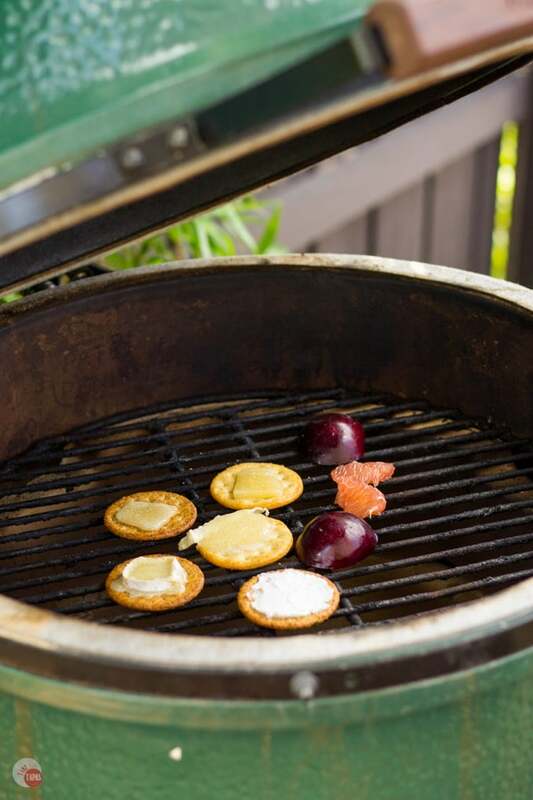 Whoa – grilling crackers? That’s a new one for me, but love the toppings you have. I’m sure these would be very interesting – and delicious. Great for an evening cookout with friends. Thanks! I love that everything is out by the grill so you don’t have to keep going back in and out. How fun are these! They could so easily go on while the grill preheats!! Thanks for sharing with us on Throwback Thursday! I love the idea of grilled crackers. They look so mouthwatering delicious, have to share. 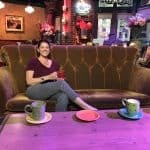 I’m glad I found your blog from Weekend Wind Down. oh my goodness! You’re making me hungry! I love your photography :)Thanks for sharing at #HomeMattersParty hope to see you back! I would have never thought to grill crackers! These look fabulous. Definitely must try! Jennifer, I just love the idea of these grilled crackers as individual nachos. 😉 Just when I thought your totcho recipe couldn’t be topped, you made grilled cracker indiv nachos. How cool is that? Meanwhile, I’ve never heard of grilling crackers, but now I have to try it! Now’s the perfect time, right? Happy Summer to you! Can’t wait to see what else you have in store for us. Now you don’t have to have a separate cooking session for your pre-bbq appetizers! These look so good! Thanks for sharing your post at the #InspirationSpotlight party. Pinned & shared. This looks like so much fun! Finally something that my toddler can help prepare and watch being grilled (from across the yard 😉 ). I can’t wait to try it! Thanks for sharing. What a unique and creative idea! I love it! Thanks for sharing on the What’s for Dinner Linky! What a great idea, I never thought of grilling crackers. Thank you for the inspiration! That way you can have snacks while you are grilling the rest of your food! I’ve never thought to grill crackers before but I’ll bet it adds a delicious flavor! I’ll have to throw some on the grill at our next cookout! Thanks so much for sharing your recipe with us at Share The Wealth Sunday!